You know when you move to a new city and have to find all new…everything – a new hair person, nail place, dry cleaners, car place, etc.? We’re right in the middle of all that right now. It’s like every day there’s a new reminder that we’re the new kids on the block. Don’t get me wrong, I love it; the change is fun and exciting. But wow, you don’t realize how comfortable you’ve been in a place until you have to start all over again. Like, what a luxury it is to be able to hop in the car and know exactly where Target is and how long it will take you to get there (without having to consult Siri). Or to be able to get in and out of the grocery store super fast because you know exactly what they have and where to find it. Grocery shopping can be one of the most routine things we do. I usually make my big trip for the week on Sunday and typically pick up the same staples – a whole organic chicken, a bag of lemons, greens, onions, etc. And after awhile of this it’s almost like you go into autopilot – you go in, walk the same aisles, grab the same things and get out. You’re so focused on your routine and completing it you probably don’t even see what else is on the shelf. That’s when shaking it up can be a really really good thing. When your surroundings change it’s an opportunity to try new things and perhaps expand your palette… that is, if you choose to look at it that way. So, on my first grocery excursion in our new neighborhood in Austin I could have gotten all bent out of shape when I didn’t find my usual whole organic chicken. 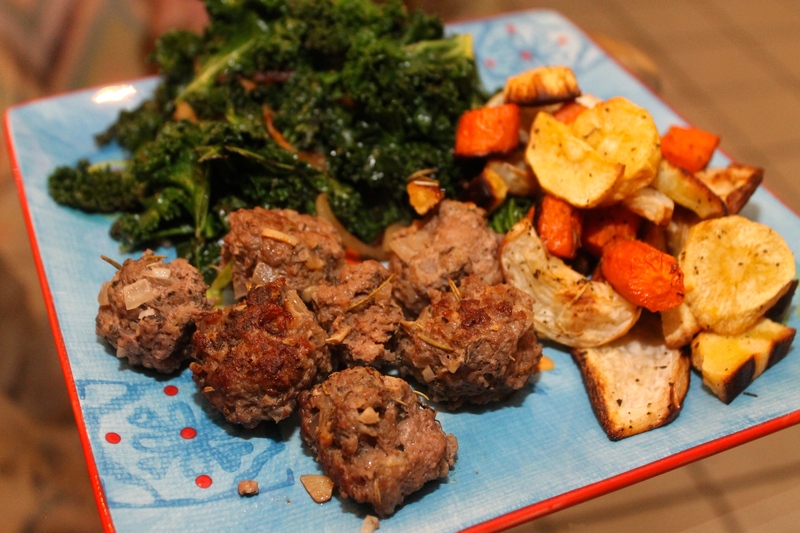 But, I held it together and got adventurous… and that’s how these delicious herby lamb meatballs came to be. Combine ground lamb, garlic, onion, thyme, rosemary, basil, salt and pepper in a bowl and mix well using your hands. Form into balls, about 1 inch thickness. In a medium saute pan, heat coconut oil over medium heat. Add meatball and cook 1-2 minutes until seared, then flip each one to sear the other side. Cook another 1-2 minutes until lightly browned. Add water, cover pan and let simmer about 5 minutes until meatballs are cooked through. Serve with your favorite roasted vegetables and sautéed greens. Thanks for the idea and recipe for tonight’s dinner! It sounds easy and delicious.